The Belgian Malinois is a multi-talented dog. It is employed in all sorts of work including guarding, tracking, narcotics and bomb detection, herding, cart and sled pulling, and search and rescue! The Belgian Malinois is a herding breed. It is very hardy and energetic, and is wildly popular in its native country of Belgium. The Malinois is one of four types of Belgian Sheepdogs. These were each developed from other working dogs, and all are very skilled at herding. Although the Malinois was not bred as a pet, it can make a very good one. It loves being treated like part of the family. It is very loyal and loves children. It is also very protective, making it a great guard dog. Exercise caution when it is around other pets and watch for a dominant behavior towards other dogs. Good socialization when it is young will most likely help it get along with other family pets. Video gives a great understanding of this breed. Common Name(s) Belgian Malinois, Malinois, Belgian Shepherd Malinois, Belgian Shepherd Dog, Mechelaar, Mechelese Herder, and sometimes referred to as Belgium Malinois. Breed Type The Belgian Malinois is a herding breed. One of the four types of Belgian Sheepdogs, the Malinois is a hard worker that is skilled at herding. This breed is best suited to cooler climates, but is adaptable to warmer ones. Background The Malinois is native to Belgium, where it is exceedingly popular. The Malinois is closely related to three other types of Belgian Sheepdogs: The Tervuren, the Laekenois, and the Groenendael. All of these breeds were developed exclusively from other working breeds, creating dogs that are hardy, tough and energetic. Belgian Malinois have been employed in all sorts of work, including guarding, tracking, narcotics and bomb detection, herding, cart and sled pulling, and search and rescue. They are also good at obedience, agility, and many other activities. A variation of the Malinois is the Berger Belge a poil court autre que Malinois. This breed is nearly identical to the Malinois, but have different markings than the norm. Description The Belgian Malinois is a solidly built animal with a deep chest and muscular hindquarters. The head is flat with a fairly long, tapering muzzle. The ears are triangular and erect, and the eyes are small, dark and almond-shaped. The tail is long and should reach or extend past the hock. A Malinois has a short coat that is gray, fawn or mahogany. The face and ears are black, and the hairs on the rest of the body should have some amount of black tipping. Male Malinois measure 24 to 26 inches tall, and females measure 22 to 24 inches tall. Both sexes weigh between 55 and 65 pounds. Care and Feeding Malinois need diets that are low in fiber and high in protein. The best foods for this breed would include poultry, ocean fish, and wheat. The short coat of the Malinois requires minimal care. It should be brushed regularly with a firm brush, especially when shedding. Bathing should be avoided as much as possible, because it will remove the coat's natural waterproofing. The Malinois has dewclaws on both the front and back legs. They should be removed from the back when the dog is a puppy, and may also be removed from the front if desired. The Malinois sheds constantly, and does so heavily twice a year. Regular vacuuming of carpet and furniture is crucial. This breed is also prone to skin allergies, so it's important to remove the source of any breakouts if possible. Housing Your Dog The Belgian Malinois can live indoors or out, but usually prefers to sleep indoors. It needs a yard that's large enough to run in, and fenced if possible. Social Behaviors The Belgian Malinois is a loyal companion, and does well with children if well socialized as a puppy. It may display dominance toward other dogs, and caution is advised when introducing a Malinois to other non-canine pets. But good socialization will make it more likely that your dog will get along with other pets. Handling and Training Malinois are highly intelligent, but they require firm training. If the trainer is overly harsh, however, the dog may become uncooperative or over-sensitive. Activities The Belgian Malinois needs lots of exercise, and preferably some type of work to do. It should be allowed to run off-leash regularly. Breeding/Reproduction Belgian Malinois usually have six to ten puppies per litter. When selecting a mate for your Malinois, check bloodlines for hip and elbow dysplasia, eye problems, epilepsy, and thyroid disorders. Common Health Problems Malinois are generally healthy dogs. Potential health problems include cataracts, hip and elbow dysplasia, epilepsy, and thyroid disease. Regular checkups are important to minimize the occurrence of these health problems and treat them if they do occur. Availability Belgian Malinois are somewhat hard to find in most countries other than Belgium, but breeders can be located online. Prices range from $500 to over $1,000. 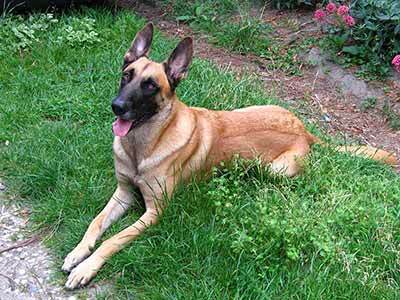 I am adopting a Belgian Malinois soon . A beautiful male . He was a Navy pup in training but went on to a breeder. So he has been trained very well. I already love him. I do plan on having him be a stud because he is not fixed and he has excellent blood lines. But no cross breeding. Is it fine that I mate my pure belgian malinois to labrador crossbreed? By the way I already mate them, I have already 9 puppies, and it is more on belgian looklike.